This is the column that started what would become 99 columns in 2015 (some you’ve not seen yet) for CandysDirt.com. I’ve been frequently asked how I got started. It’s simple … revenge! After attending a particularly egregious HOA meeting, I penned a screed to Candy detailing the insanity of the building I lived in. Of course she jumped at the chance to “out” some craziness. By morning, I’d had a rethink about shooting myself in the foot (as you do) and said, perhaps there’s more to me than a one-hit-wonder. She agreed to give me a shot. Enjoy. And here’s to another 99 in 2016! Condo sales are still brisk compared to last year, but sales have decreased an average of one percent between January and May of 2015, says the Texas Association of Realtors‘ recent report. 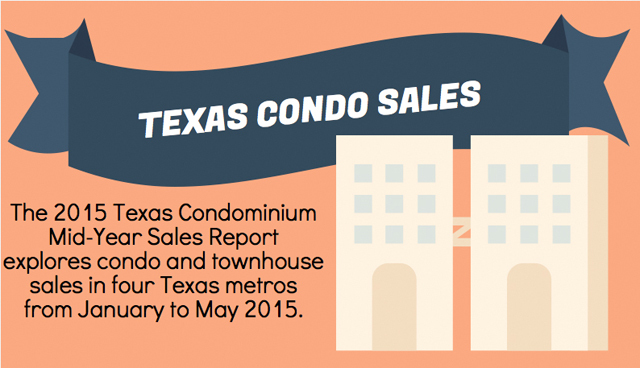 Using data from the Real Estate Center at Texas A&M University, The 2015 Texas Condominium Mid-Year Sales Report shows that condo and townhome sales are flat or slipping in the four largest markets. 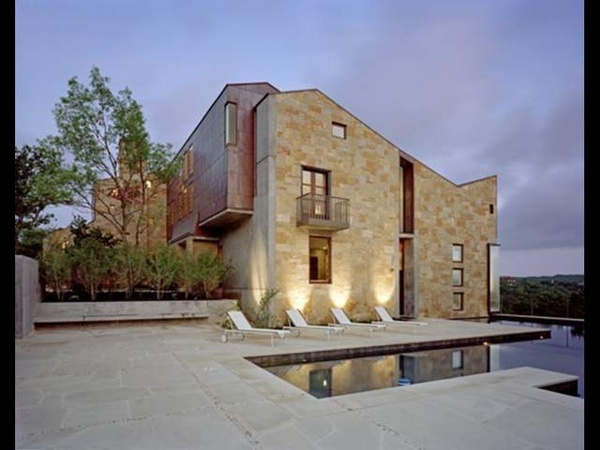 With runaway demand, Austin still leads the price-per-square-foot category, while condo sales actually decreased 12 percent year-over-year in the state capital. Both Dallas and San Antonio posted modest gains of 3 and 6 percent, respectively. Houston condo sales dipped just 1 percent from the same time last year. Jump for more interesting stats. 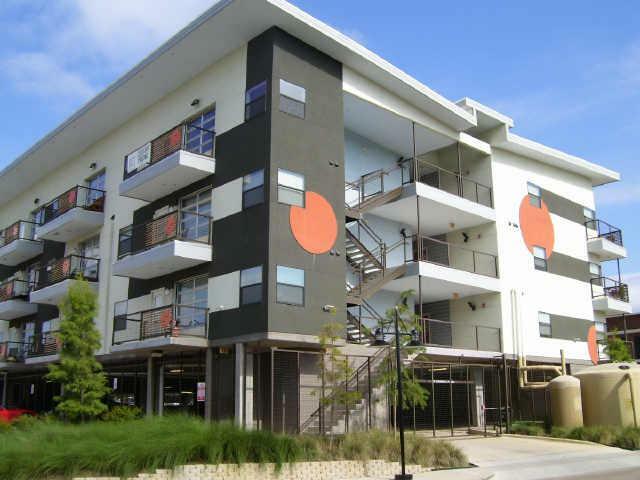 Modern and affordable, Buzz Lofts in the southern Dallas neighborhood of The Cedars are a popular choice for those who want loft living south of downtown Dallas. 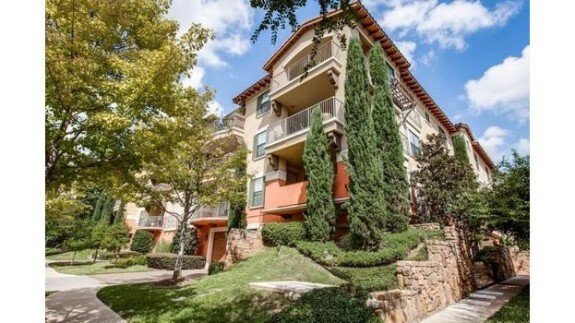 Condos are hot and getting hotter, according to the Texas Condominium Mid-Year Sales Report from the Texas Association of Realtors. Statewide, condo sales rose an average of 10.5 percent year-over-year between the months of January and May of 2014. In San Antonio condo sales were up 18 percent, followed by Austin at 14 percent, Houston at 6 percent and Dallas at 4 percent. Real Estate Gone Wild: It's Party Time at My New TV Show, The Party Line! I LOVE IT when Real Estate agents get together and TALK! After all, it’s Friday. And we know there is no better way to network than at a party with the top agents in town, great food, a little string quartet music, and a Candy Bar! Well, we got a whole camera crew and invited Realtors to have some fun and give me the inside scoop on this crazy market. It was such a success, we are going to have a party and a Candy Bar every month! And you are invited to come and share! The Party Line is exactly what happens when we gather at a fantastic listing, network, and share who’s selling what, the hottest ‘hoods, best builders and what’s coming up. Want to know how the stars of Real Estate sell those mega homes? We’ve got a camera rolling, so you can find out! 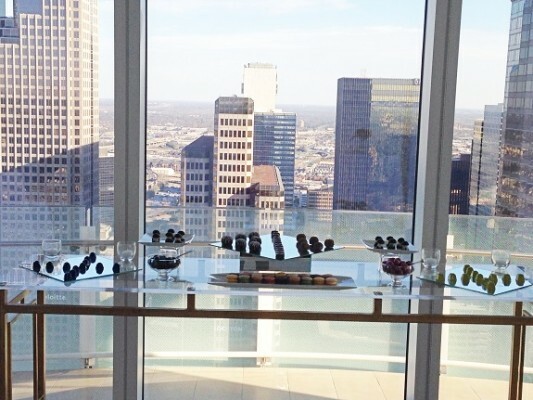 Here’s our very first Party, at beautiful Museum Tower, in the heart of Dallas’ vibrant Arts District. Dallas’ high-rise neighborhoods saw a 36.4 % increase in the number of units sold and almost a fifty percent increase in volume last year. Yee haw! 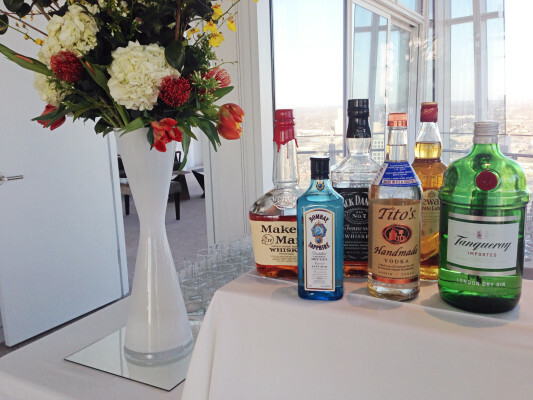 Museum Tower today, but where will we party tomorrow? 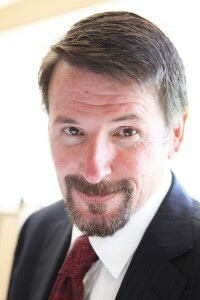 Maybe a beautiful home in Highland Park, Preston Hollow or Allen. Maybe we’ll head up to Craig Ranch or Light Farms. I want to thank all the agents who came in from all over — Joan Eleazer, Mark Cain, Caroline Summers, Kyle Crews, Jonathan Rosen, Joe Kobell, Kyle Rovinsky, Missy Wohr, Clay Stapp, Tom Hughes, Molly Malone, Becky Frey, Pogir, David Maez and Tom Branch who drove in all the way from Plano, for coming to my party! Yeah, Phillip Day came in from the Bahamas, just for me. What are they doing, saying, selling? Are they behaving? We hope NOT! Living inside 635 makes perfect sense for the under 40 set, especially considering how kid-friendly many neighborhoods are becoming as homebuyers are choosing to live closer to work, shopping, and amenities. For a low-maintenance lifestyle that allows you to lock and leave while not skirting amenities, this great unit inside the Vallera Condominiums is the perfect choice. 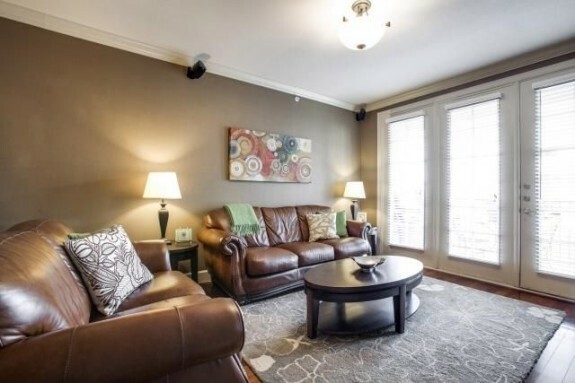 With two bedrooms, two baths, and more than 1,300 square feet, this condo is great for a young couple, or even a young family who wants to be close to arts and culture inside one of Dallas’ most walkable neighborhoods. 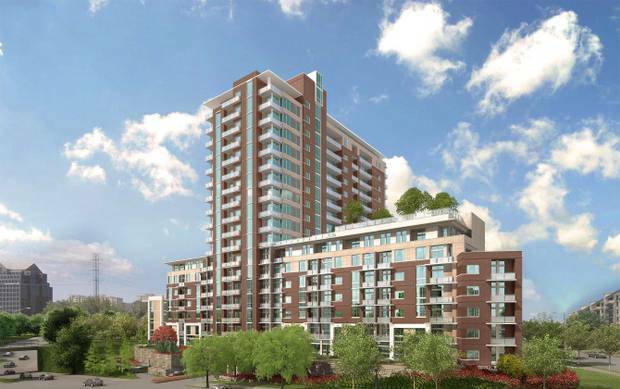 Unit 107 at 3818 Holland Avenue is marketed by Hailey Hunt-Wagstaff of Dave Perry-Miller InTown for a reduced $274,900. 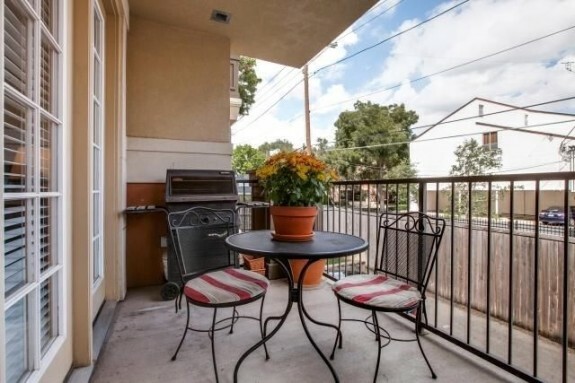 thats a fabulous price considering the location and upgrades inside this unit. HOA dues are a reasonable $255, too. The first thing you’ll notice when you walk in this unit is the hardwood floors, which span all the way to the French doors to the balcony. The dark-hued wood really makes the moulding and lovely neutral paint pop. 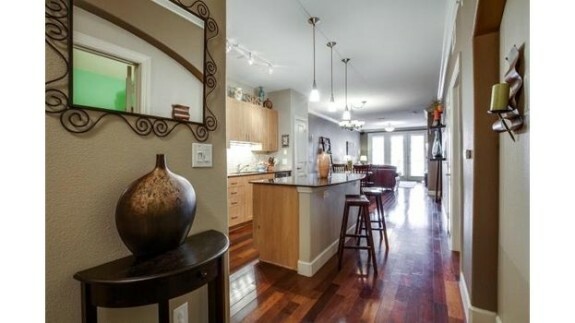 The unit is fantastically open — great for having friends over — and features a gorgeous kitchen with beautiful honey-colored cabinets, granite counters, tumbled stone backsplash, and plenty of lighting. 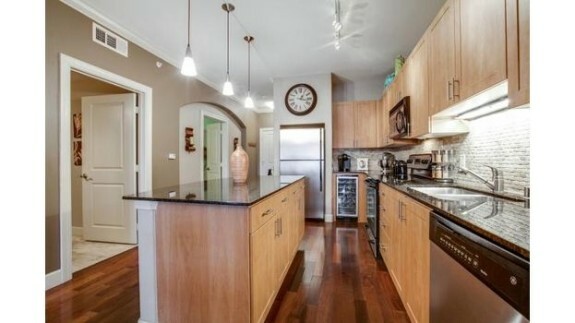 Of course, you’ll find stainless steel appliances, including a wine cooler. 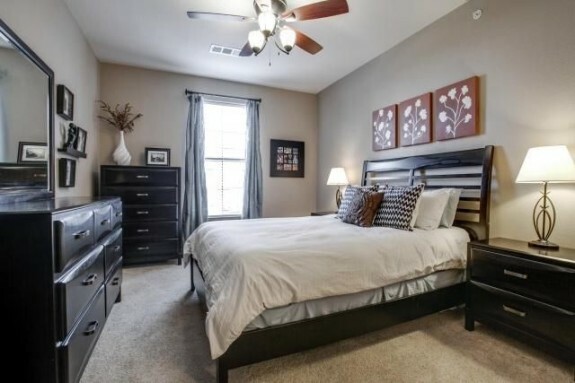 The master suite is a great size, and has a perfect tone of grey on the walls, which is just a shade off from the carpet. I am not a lover of carpet in most cases, but in condos, I change my tune. Considering the fact that you’re not constantly tramping in and out, carpet inside a condo is a great idea to make the space feel more cozy and personal. And if you’re not a fan of what’s already there, it’s pretty inexpensive to replace. 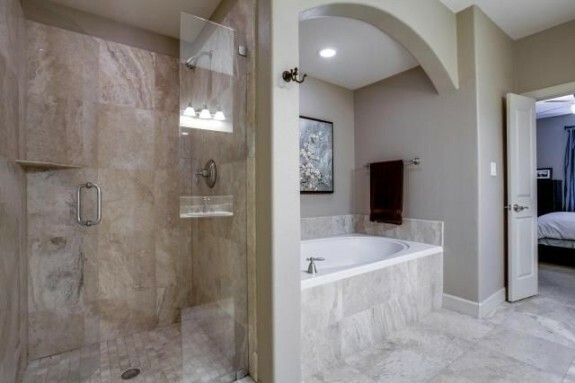 The master bath is really lovely and just drenched in stone. 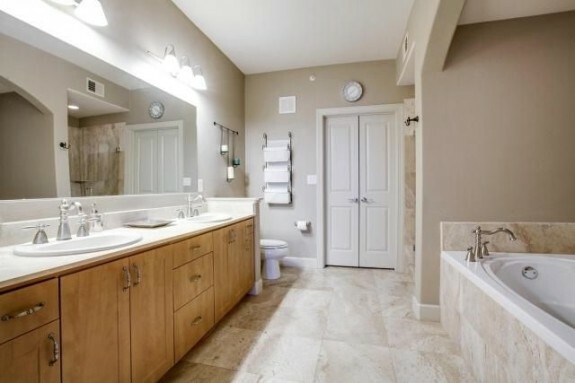 It’s a five-piece affair with a generous-sized shower, a soaking tub, and a very nice vanity. The plain, frameless mirror is a bit boring, but if you’ve staked out Pintrest as much as I have, then surely you know that it’s a snap to add a frame around it. I think what surprises me the most about this unit is the value. With a location like this and upgrades that many first-time homebuyers are looking for, this unit is a great place for someone looking to simplify inside the loop.